Welcome to our blog series about basic taekwondo moves! While martial arts are a neverending journey of improvement and progression where you’re always learning new techniques and advanced forms, there are also certain fundamental moves that make up the bread and butter of any fighting style. Taekwondo is no exception — even a student who’s testing for second-degree black belt will use a variety of moves that they learned on their first day of class as a white belt. 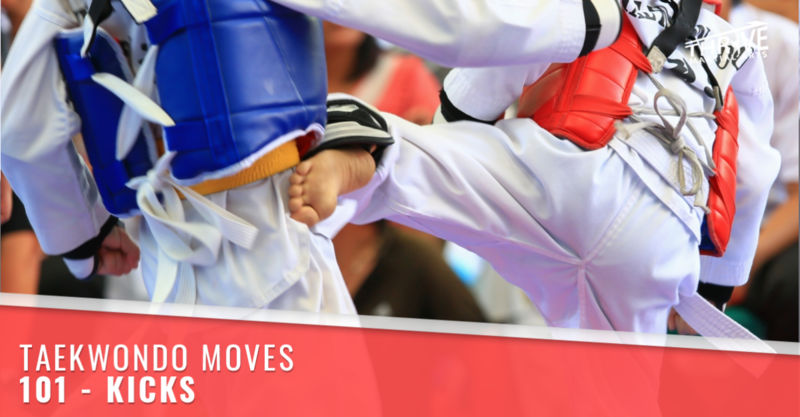 In this blog series, we’ll go over fundamental taekwondo moves, from kicks, to punches, to blocks. We’ll start off with kicks. Taekwondo, after all, means “the way of the hand and foot,” and kicks are one of the biggest focuses of this martial art. Let’s take a look at some fundamental kicks in taekwondo! Before we talk about basic Taekwondo kicks, it’s important to acknowledge the components of a kick. If you’re unfamiliar with karate or taekwondo, this might sound strange to you. Doesn’t one just, y’know, kick? It’s actually a bit more complicated than that, and these steps, if followed, are what differentiate martial arts masters from untrained fighters. Chambering: In a good kick, you’ll notice that the leg is never totally straight until right up to the moment where the kick lands. This is because of chambering. Chambering is basically “winding up” your kick by moving your thigh into position, before the kick explodes forward into a powerful blow! The term is derived from firearms, where you “chamber” (or load) bullets into the gun before they’re fired with powerful force. Execution: It’s not just about hitting your target — you need to do it right. Every kick connects with a different part of the foot. Having good form means that your kick lands in the right spot, with the right amount of power, with the right part of your foot. Rechambering: Just like you need to set up a good kick, you also need to come down from it properly. If you just let your leg drop after your kick, it can cause you to fumble awkwardly or lose your balance. Rechambering is when you “fold” your leg back up to starting position, and return to your initial stance, or into a new one to set up for another move. The front kick is one of the most basic taekwondo kicks, and you might learn it as early as your first class in martial arts school. It’s fairly straightforward — you kick directly in front of you. With front kicks, there is no rotation in your stance. It’s possible to kick using either your front leg or back leg, but it’s important to chamber correctly, which involves centering your balance on whatever foot you’re not kicking with. Because you’re kicking directly in front of you, it’s easy to lose balance if you don’t shift your leg correctly. Typically, the front kick connects with the balls of your feet. If there was a category for “most iconic martial arts kick,” it would go to the side kick. The side kick, predictably, is a kick that’s aimed towards the side. When you see somebody kick in a straight line outwards, bending their torso almost 90 degrees, you’re witnessing a side kick. A side kick doesn’t actually need to hit a target that’s on your left or right side — it’s called a side kick because it comes from your side. You can side kick somebody directly in front of you as long as you rotate into the right position! That’s why proper chambering is important. Part of the chambering process for a side kick is adjusting your stance in the right direction and pulling your thigh towards your chest to “wind up” the kick. You then extend your leg straight, delivering an effective and powerful blow. A properly executed side kick will connect with the heel, with the torso moving to a near 90 degree angle to facilitate the motion of the kick. If both of these things are done properly, it results in one of the most powerful kicks in the taekwondo arsenal. The best way to describe a round kick is that you’re swinging your back leg into an upwards arc to hit a target directly in front of you from the side. A good way to visualize this is by imagining a punching bag. A front kick or a side kick would land directly in the middle of it, but a round kick would hit it smack in the side! Round kicks are effective for hitting targets in front of you from the side, and they’re also useful for changing stances and leading into other combos because you fully rotate your body to land one. In more advanced forms, round kicks often lead directly into other moves, such as side kicks or back kicks. A solid round kick will connect with the front of your foot, right around where your foot meets the calf. From there, you either rechamber it back down into your starting position, or transition into another move or stance. A back kick is more or less the same as a side kick, only you’re kicking directly behind you. In most ways, the chambering and execution are very similar. A back kick, like a side kick, requires you lower your torso to leverage more power into the blow — only instead of leaning sideways, you lean forward, opposite the direction of your target. Like a side kick, it also connects with the heel, and it’s also one of the more powerful kicks. In an actual fight, you generally want to focus on keeping opponents in front of or around you. Back kicks are a good tool to stave away a target that comes from behind, ideally giving you time to adjust your footing to put yourself in a more favorable position where you can fight them in front of you. The word “crescent” is most often used when referring to crescent moons, where the moon is shaped like a “C.” This is fitting, because in a crescent kick, your leg creates that shape with its motion, creating an arc in front of you. A crescent kick is chambered similarly to a front kick — you bring up your thigh, bending your leg in front of you. Only, with a crescent kick, you aim your chamber slightly to the left or right of your target, because in the execution, your calf explodes forward and you hit your target with the side of your foot, bringing it down in an arc-like motion. Crescent kicks aren’t quite as easy to pull off as the other kicks, and aren’t as common in forms for lower belts. They require a higher degree of flexibility to pull off well, and their usage is also more specialized. Crescent kicks are more about disrupting your enemy rather than hitting them with a powerful blow. Crescent kicks are excellent for hitting your opponents’ arms and hands, knocking them out of the way or disarming them. They can also lead into hook movements in more advanced moves, potentially allowing you to grapple your opponent with your leg. These five kicks are part of the basic DNA of taekwondo. There are plenty of advanced moves out there, but most of them are evolutions of these kicks, or follow-ups from them. Want to learn how to kick like a bona fide karate master? Stop by our martial arts school in Fort Collins or Windsor! We’ve had countless Colorado students of all ages. We invite you to stop by and try out a trial membership to learn if it’s for you. Stop by or contact us today!